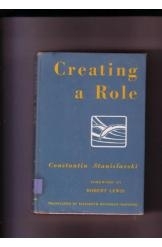 Creating a Role by Constantin Stanislavksi, foreword by Robert Lewis, translated by Elizabeth Reynolds Hapgood. This book is a must for any actor. The first part of the book is a break down of how to work on a part. The second part is Shakespeare's Othello, and the third part is Gogol's The Inspector General, 271 pages.